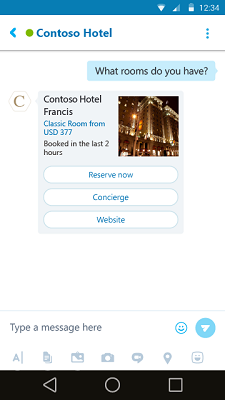 Skype bot cards are visual cards that provide information to help you perform tasks such as finding hotels, making reservations, booking flights, even displaying receipts. There are four types of visual cards. 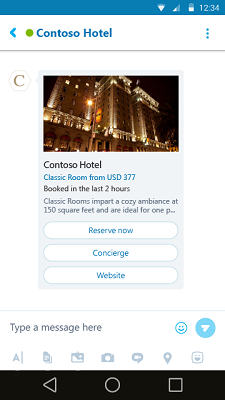 What is a Skype bot Carousel card? 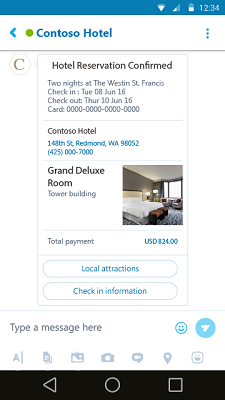 Carousel cards allow you to scroll through a list of business cards to help you gather information or make decisions such as which hotel to stay at. What is a Skype bot Hero card? Hero cards enable direct interaction with businesses, providing ways to ask questions, make reservations, or visit their website. What is a Skype bot Thumbnail card? Thumbnail cards are smaller versions of Hero cards. They enable direct interaction with businesses, providing ways to ask questions, make reservations, or visit their website. 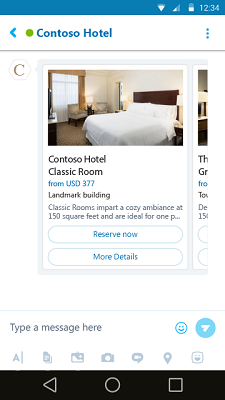 What is a Skype bot Receipt card? The Receipt card provides a way of receiving receipts for purchases, (not all bots are set up to send receipts). 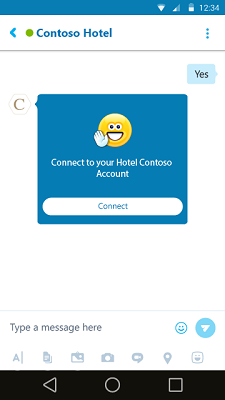 What is Skype bot third party authentication? Third party authentication allows you to connect your accounts and make a purchase directly from the bot card. You will see a card asking you to connect your account, just sign in to make a purchase.